California is facing an unprecedented crisis in housing affordability for a one simple reason: Nearly every community in the state has been failing, for decades, to build enough housing. And not just by a little bit, according to a new McKinsey Global Institute report released this week. In A Tool Kit to Fix California’s Housing Shortage: 3.5 Million Homes by 2025, McKinsey estimates that California has fallen several million homes behind since the last major housing construction boom in the 1980s. To match the number of houses per person in New York or New Jersey, the state would need to build 3.5 million more homes over the next decade. This chronic underproduction is having far-reaching economic impacts—with rising home and rental prices swallowing up $140 billion in economic activity each year and forcing nearly half of California households to struggle to buy or rent a home in their community. The only way to solve a problem of this magnitude, McKinsey concludes, is to move toward policy solutions on a similar scale. The new toolkit does exactly this, offering a rigorous, first-of-its-kind quantification of how many housing units different policy options could actually produce. McKinsey’s ideas will be featured at the next Summit on December 13-14 in Sacramento, and the Summit is also working to ensure their analysis is included in state policy conversations in the coming year. Vacant land – 225,000 units: After conducting a GIS mapping analysis of California’s urban areas, McKinsey estimates that cities with populations over 100,000 have the capacity to build as many as 225,000 housing units on vacant urban land already zoned for multi-family housing. While McKinsey notes that a third of this opportunity is in Los Angeles County, cities like Fresno also have the potential to produce as many as 27,000 units. The report offers several ideas for getting building underway, from tax changes that could push owners to bring vacant sites to market to accelerated land-use approvals akin to the administration’s 2016 by-right proposal. Transit oriented housing – 1,200,000 units to 3,000,000 units: Without dramatically changing existing growth patterns, McKinsey estimates up to three million new units could be produced by 2035 within a half-mile of California’s existing 1,095 transit stations. While some rezoning would be required, this estimate relies on a model of housing production that mirrors existing “urban types” around these stations—with suburban areas (the Hanford Amtrak Station, for example) currently built out at less than 6.5 units per acre, urban centers (like the Virginia Light Rail Station in San Jose) at 6.5 to 15 units per acre, and regional hubs (like the Wilshire and Vermont Metro Station in LA) at higher densities. Underutilized land - 1,000,000 units: In perhaps its most politically sensitive proposal, the report also focuses on the potential of repurposing “underutilized” land—that is, parcels with densities well below what existing zoning ordinances allow. More than 30 percent of San Francisco’s multi-family parcels are currently “underutilized,” according to McKinsey’s analysis, as are 28 percent of multi-family parcels in Los Angeles. The report suggests that if cities focus on these parcels, while creating zoning carve-outs and mitigating for the risk of displacement, they could produce one million units of housing—70,500 units in San Francisco and 306,000 units in Los Angeles. “Adjacent” land – 600,000 units: While much of McKinsey’s focus is on infill development, the report also explores “smart growth” opportunities in other areas close to jobs and transit. Applying a methodology that puts a premium on small lot sizes and proximity to transit and existing development, McKinsey estimates as many as 600,000 single-family housing units could be built in three counties alone—San Bernardino, Sacramento, and Contra Costa—with all of this growth occurring within 20 miles of a jobs center and most of it within five miles of public transit. 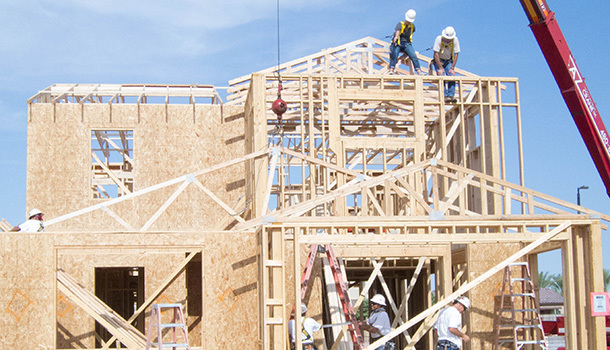 RHNA incentives – 330,000 units: Every local government in California already has a housing production target assigned to it through the Regional Housing Needs Allocation (RHNA) process. But while cities are required to plan for this development, no region has come close to actually hitting their housing target. McKinsey estimates that if the state could entice local governments to raise their housing performance by even 30 percent—for example, via fiscal incentives for cities that approve “already planned-for housing”—communities could produce 40,000 more units annually, or 330,000 units by 2025. The report notes that regional incentive programs such as the One Bay Area Grant Program are already achieving results. New state General Fund expenditures: This year’s $400 million proposal from Assembly Democrats would have resulted in 5,000 affordable housing units per year. New state General Obligation bonds: McKinsey estimates that a $3 billion proposal considered this year could be expected to produce at least 4,000 units per year (with leveraged funds more than doubling that number). Widespread adoption of county General Obligation bonds: If half of the 18 urban counties passed $500 million bonds every ten years, McKinsey estimates they would produce an estimated 5,000 units a year. New permanent funding source: A $75 fee on recording real estate transactions could produce more than 5,000 units of affordable housing each year.